Ive been a member for a few years now, and add updates on my layout once a month too find im the only person to add replies lol. Don't take it personally. I noticed the forum change when a few members joined up, and they tend to forget that that forum is for beginners, not rivet counters. It's a hobby, not a competition. A lot of people I remember on there have left, and the number of posts slowed down. A great shame. I left some years ago after some discussion over rather ignorant comments which were posted about the guys in our RAF, Navy & Army who look after our freedom and that of others around the world. If you want to join another forum that is very friendly and caters for tastes other than N (no accounting for taste I know) then try http://yourmodelrailway.net/ you will have to request to join as it is a closed forum. I'm afraid those sorts of attitudes permeate all hobbies and interests. I've had it certainly at exhibitions...perhaps I have been fortunate on forums as I have not been subject to come of the criticism that others have reported. 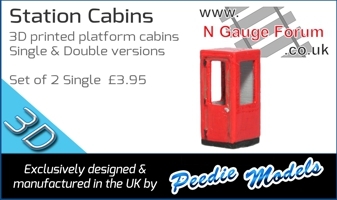 I do recall one exhibition a few years back, when I was working the fiddle yard on our club's 0 gauge layout.